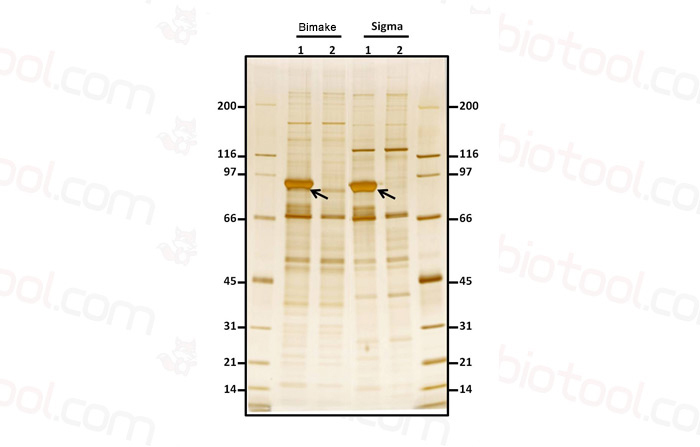 Co-immunoprecipitation assay was performed to prove the interaction of FUZ and BNIP3. 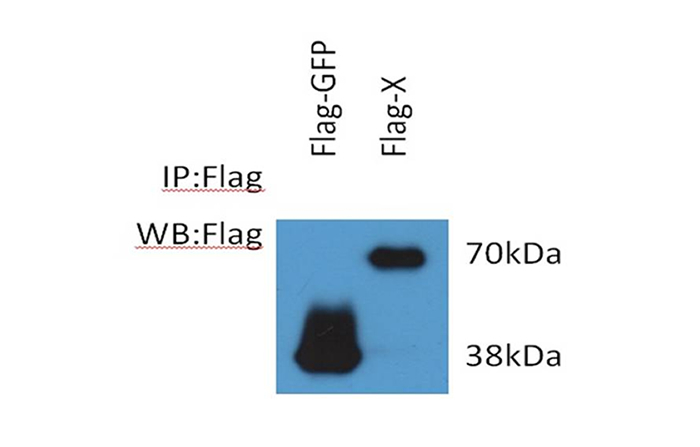 A549 cells were transfected with Flag-FUZ and BNIP3-His plasmids. 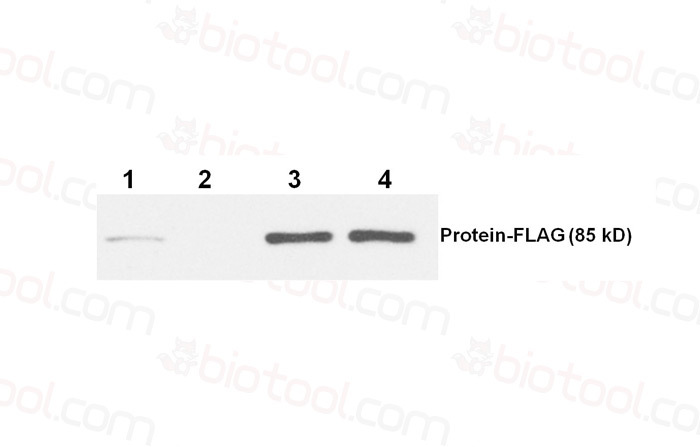 Flag-RIOK plasmid was used as negative control. 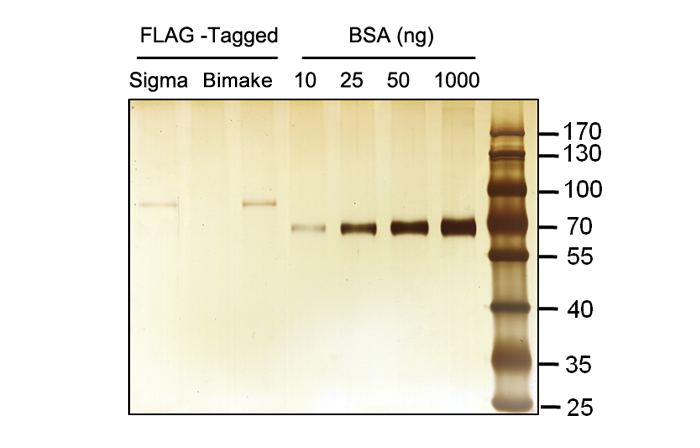 Bimake Anti-Flag Affinity Gel displays an advantage over Sigma ANTI-FLAG M2 Affinity Gel in FLAG-tagged protein binding capacity. Red arrow shows the target protein in elution. 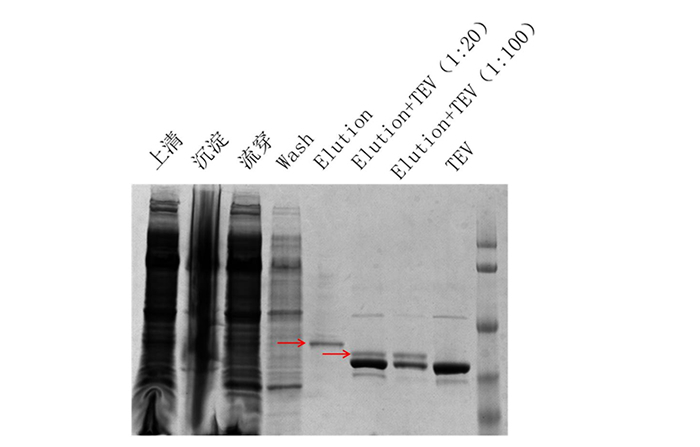 TEV is a protease which is frequently used for the controlled cleavage of fusion proteins in vitro and in vivo. 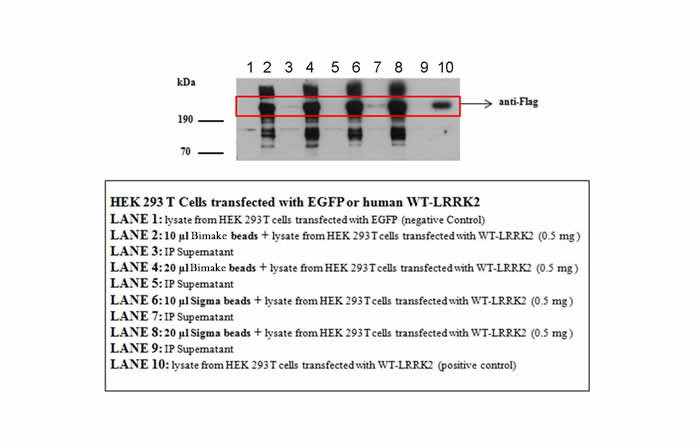 a, HEK293T cells were co-transfected with relevant plasmids, cells were collected at 48 h after transfection and immunoprecipitated with anti-Flag gel (Bimake, B23101). “*” non-specific bands. 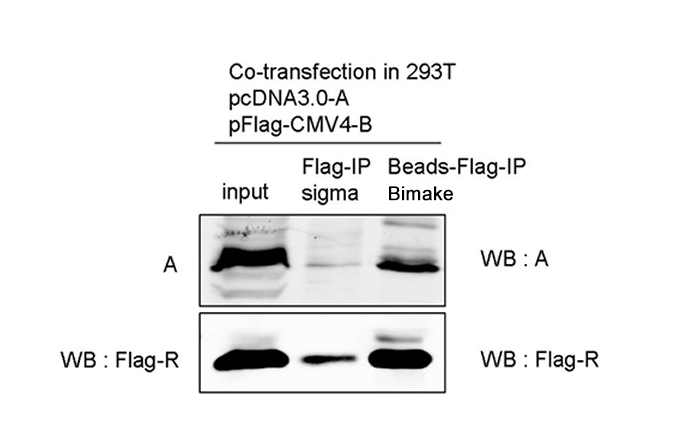 b, HEK293T cells co-transfected with GFP-SUMO1 or its SUMOylation mutant and Flag-α-catenin. 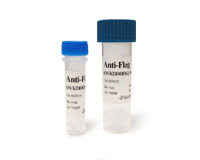 Cell extracts were inmmunoprecipitated with Flag gel described in a. (A) Anti-Flag resin pull down of mEphA4LBD and untagged zRETECD with immobilized zefn-A5ECD. The black arrows in Lanes 3 and 8 point to the mEphA4LBD pulled down by zefn-A5ECD. 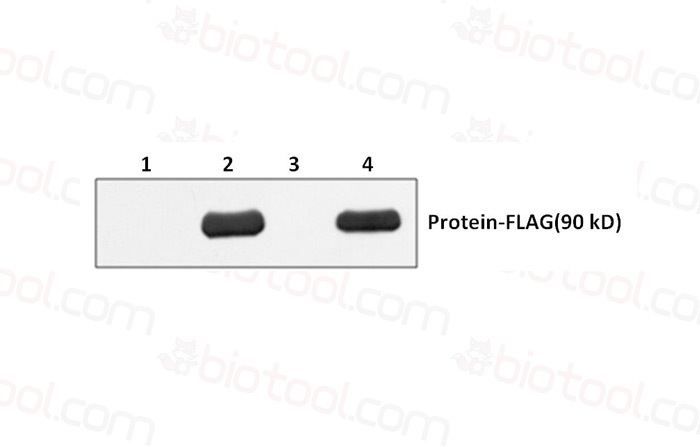 (B) Protein G bead pull down of zRETECD and zefn-A5ECD with immobilized mEphA4LBD. The black arrows in Lanes 1 and 4 mark the zefn-A5ECD pulled-down by mEphA4. Molecular weight standards: PageRuler Plus standard protein ladder in Lanes 1(A) and 2(B). PD: samples eluted from the beads after pull down. 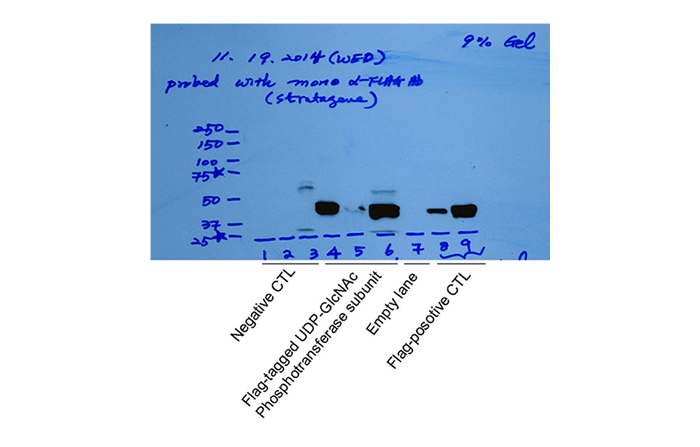 Lanes without the PD label contain input protein samples as indicated.